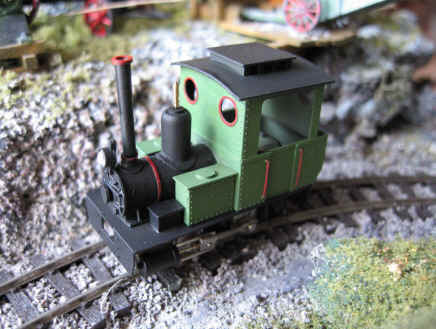 I recently purchased from Backwoods Miniatures a Japanese 0-4-0 made by the Ginza Narrow Gauge Model Club. This little loco is a nickel-silver and whitemetal casting kit with a Kato mechanism and flat can motor. It is a dead ringer for the Egger-Bahn No. 102, except it is about 10-20% smaller! The weight of the metal body and chassis, plus the modern motor and mechanism make it a really smooth runner. A friend of mine airbrushed it form me using Polly S "Steam Power Black" and my favorite Monte Sano RR green, then I handpainted the red details. I haven't decided whether to fit it with Bemo or MT couplers.